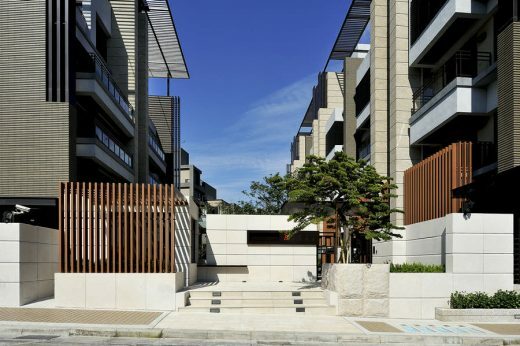 These new residential buildings contain up/down duplex townhouses: the project combines strongly articulated blocks with a pleasant environment at street level. The buildings peel away towards the top, but are completed by a light oversailing roof frame. Landscaping is generous and welcoming, combining the warmth of timber decking with mature trees. The Ritz Plaza seeks a new suggestion for up/down duplex townhouses that preserves quality of both urban spaces and private dwelling, while giving back the city a pleasant environment. The project groups the more intimate areas of two up/down units on to the second and third floors in order to avoid unwanted disturbances from the neighbors. The ground floor is purposefully raised to redefine the urban public-private edge, and at the same time to visually connect the garden of the lower unit with the parks. The upper unit’s public areas are arranged on the fourth floor which enjoys a splendid 6 meter floor-height that invites the surrounding beautiful mountainous scenery into the building. This arrangement also connects all the public areas of upper units together and provides a fluent life. The architectural expression takes on a humble yet vigorous gesture to respond to the opposite open parks, hoping its refined yet rich form will generate a sense of place, and suggest a serene life style. The prominent vertical stone cladding walls define the living domain; the sun-screen louvers, curtain wall volumes, and large scale balconies and terraces clearly express the public and private realms. Last but not least, the delicate roof structures allow natural light and shadow to produce different magical ambiance in the roof garden, bringing the space closer to life.